This room required complete redecoration. 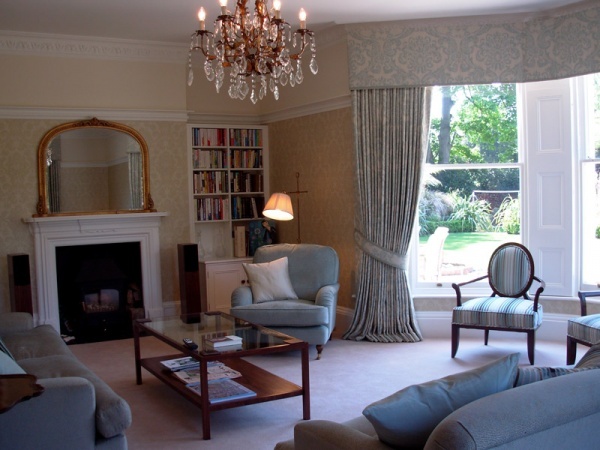 I chose a classic colour scheme and hand made sofas from Tamarisk Designs that are deep and comfortable but still retain a certain element of formality. The Cole & Son wallpaper has a traditional damask pattern with a very subtle sheen that adds a slightly more contemporary edge. The 2 occasional chairs in the bay window add elegance, covered in a beautiful cut velvet stripe from Zoffany. The deep pelmet and full curtains in a slubbed Bakers damask compliment the scale of the windows. Lighting was added, with a mix of new and existing furniture put into the room. The bespoke overmantle mirror was hand crafted and custom coloured for the room.